Every home in Arizona has, or has had window screens at some point, and of some kind. Most common are the factory window screens that come standard with every window manufacturer. 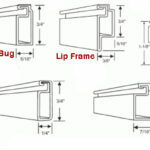 They are simply 5/16″ x 3/4″ frames with your typical bug or insect screen designed as you guessed it. To keep the bugs out. In addition, they also offer the essence of outdoor airflow during the times of the day and night that offer optimal temperatures and conditions. Whether you desire the fresh natural odors of the desert, or the cool breeze that rolls in after dark, standard window bug screens are great to have, and always needed. Screens Unlimited builds these factory replacement window screens for residents throughout the valley. 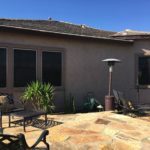 Since many homes in Arizona have history, there is often many reasons as to why an Phoenix home may be missing these factory window screens. Although every new home should come with the bug screens that come with the new windows, it is not uncommon that the screens get set to the side for the installations, and can be misplaced or lost during the construction process. In neighborhoods where there are multiple homes being built at once, there too is the possibility that theft could take place as well, as window screens are made of aluminum, and scrappers are known to wonder through construction sites looking for things that are easy to scrap. Another common problem is when the screens get damaged while being stored and never get installed or re-ordered before the house is complete. Missing screens are more common however on older homes that have had multiple owners through the years. In this case, who really knows what happened to the window screens. For one, removing and installing factory screens can often be difficult if the screens are slightly too big. In this case, many times the frame gets bent or kinked, and can never be straightened to its original integrity. This can also cause a twisting when removing that can cause the factory window screen plastic corners to break or snap. Again, a non-repairable problem. Secondly, pets and kids can be very rough on these OEM window screens. Pushing and scratching will either break the frame, snap the corner, or tear the fabric. Lastly, the Arizona sun does the most damage to window screens over time. The sun causes the factory corners to become brittle and essentially impossible to handle without breaking, and will rot the fiberglass insect mesh to the point where a simple grazing of a blunt object with create giant holes and tears that create entry points for all the bugs. Screens Unlimited is one of the valleys premier window screen companies, and can help with any of the aforementioned window screen problems. Whether they are broken, damaged, missing, or stolen Screens Unlimited has the replacement screens that you need to keep the bugs out, and allow the comfortable breezy air in.